The Tipping Point: A Climate Neutral World Now! Attention Nordhaus and Shellenberger: Time to Call A Cease-Fire! In 2004, Ted Nordhaus and Michael Shellenberger released their provocative and much-discussed essay, "The Death of Environmentalism," in which they criticized the environmental movements lack of progress towards global warming solutions and argued that a fundamental shift in philosophy, messaging and tactics was necessary to capture the American public's interest and build a successful movement for climate solutions. Now, the two "bad boys of environmentalism" are back with a new book, Break Through: From the Death of Environmentalism to the Politics of Possibility and they're making waves again with their provocative and arguably inflammatory style. In my opinion, "The Death of Environmentalism" presented a crucially important and valid critique of the environmental movement's (failing) tactics and messaging, although it tended to present this critique with an essentialist view of environmentalism as a failed and impossible to change ideology. While I believe that environmentalism is neither dead, nor incapable of evolution (in fact, I'd argue it has evolved considerably since N&S's essay made it's debut), I strongly agree with Nordhaus and Shellenberger that the movement must reexamine it's tactics, strategy, and messaging as it attempts to build a broad, powerful and successful movement to rise to the greatest challenge and seize the greatest opportunity facing us today: the climate crisis. I've yet to read Nordhaus and Shellenberger's new book, but I've been following the sometimes quite turbulent wake it's made across the blogosphere this past week with much interest. For example, both the Sierra Club's Carl Pope and Step it UP's Bill McKibben reviewed Break Through for GristMill and Nordhaus and Shellenberger responded today with a "rebuttal" piece. The funny thing is, despite all the "debate" that Break Through has kicked up, I'm struggling to see what all the arguments are about! Nordhaus and Shellenberger speak of "the environmental community's regulation-only agenda" and critique the regulatory "tool-of-choice," a cap-and-trade system, flat out asserting that "it won't work." They present their essay at GristMill as a rebuttal to environmentalist, the next chapter in some ongoing debate. On the other side, Bill McKibben describes Nordhaus and Shellenberger as displaying "antipathy" towards cap-and-trade regulations and touting "an investment-centric agenda" as the solution to the climate crisis. The funny thing is, beneath the aggressive and down-write adversarial tone of Nordhaus and Shellenberger and the understandably defensive tone of folks like McKibben and Pope, there's not much the two supposedly warring sides disagree on! So here's a question for Nordhaus and Shellenberger: who are you arguing with?! Nordhaus and Shellenberger and their Breakthrough Institute cohorts keep taking a stridently adversarial tone towards the very people who should be their allies - environmentalists and clean energy/global warming activists (who may or may not consider themselves the same people). Largely due to this combative manner, I would argue that Nordhaus and Shellenberger have manufactured an argument that doesn't truly exist, a supposed conflict between regulation-centric and investment-centric camps, with "ideologically dead environmentalists" on one side and "courageous new thinkers" like Nordhaus and Shellenberger on the other. And where is this supposed argument getting us?! "Our proposal, to state it once again, is that Congress pass legislation that either auctions permits or taxes carbon enough to a) establish a price for carbon sufficient to result in inexpensive emissions reductions, b) generate at least $30 billion a year for clean energy investments, and c) creating market conditions for the widespread adoption of these new technologies." So when you boil it down, the two authors merely consider regulation an incomplete piece of the full puzzle, and the funny thing is, I don't think Nordhaus and Shellenberger will get any argument from those they are supposedly trying to argue with (the "establishment" environmentalists, clean energy advocates, and global warming activists); they'll certainly get no argument from this environmentalist! And I would argue that it's understandable that folks like McKibben consider Nordhaus and Shellenberger "anti-regulation" when you have to wade past "five reasons why setting a price on carbon dioxide, either through a cap and trade approach or an outright tax, cannot reduce greenhouse gas emissions anywhere close to what is needed" to get to their more nuanced position: that pricing carbon can't work on it's own. On the other side, Nordhaus and Shellenberger write about "the environmental community's regulation-only agenda," but where does such an agenda really exist? Which environmental groups are really putting all their eggs in the regulation basket? Which enviro groups wouldn't support massive investments in a clean energy future? The reality is, they'd be hard to find. McKibben himself writes, "The need for new technology is obviously urgent ... The question is how best to mobilize that investment." Pope writes, "Shellenberger and Nordhaus argue that greatness requires progressives to embrace such investment strategies. I agree." "Now is the time for a bold shift to a safer, cleaner energy future built on clean power and energy-saving technology. The Sierra Club believes that we can save our planet while preserving our way of life, that instead of falling into despair, we should look to this challenge as an opportunity." Why do you think there's been so much focus from environmental groups on ensuring the emissions allowances under a cap and trade proposal are auctioned instead of given away for free? Why do you think most enviro groups have been opposed to the mediocre-to-just-plain-crappy proposals of Lieberman and Warner and Bingaman? Why do you think enviro groups have been championing the best aspects of the House and Senate energy packages as a first start towards shifting our public investment from dirty to clean energy sources? What Nordhaus and Shellenberger seem to miss is that environmentalists and global warming activists aren't fighting them on this! Status-quo-loving industry interests are. "Government-is-the-problem" conservatives are. Yet the two authors present their arguments in such an aggressive manner that they make it out as if they were in some kind of controversial fight with enviros. The problem is, they're not! The bigger problem is that, while it might be a great way to get attention for their book and ideas, it's a terrible way to build alliances with the kind of folks who Nordhaus and Shellenberger's "new progressive, solutions-oriented movement" should be building alliances with, the kind of folks who are in actuality already on their side! Nordhaus and Shellenberger are probably correct that we as a movement need to strategically emphasize the public investment part (and it's benefits) over the regulation part (we do!). This is a very valid strategic critique and one that I'm grateful the pair have elevated to the fore of discussions. But what we should be seizing on is not a supposed schism in the movement, but the fact that we all seem to be in agreement that neither regulation nor investment will work on its own, and the two - cap-and-auction and public investment - are mutually supportive and necessary components of a true solution to the climate crisis. Playing one off against the other seems like a really counter-productive way to advance climate solutions, as does hyping up supposed rifts within the movement that don't really exist in the way Nordhaus and Shellenberger seem to want to call attention to. Putting a price on carbon is necessary to send the correct market signals and to spur private sector innovation. But this innovation can and must be accelerated by public-sector research and investment. We've got to make the transition to a carbon neutral, prosperous America as quickly as possible, and that requires public as well as private investment in our common future. Auctioning emissions allowances or taxing emissions can not only send the right market signals to the private sector, but can also raise the necessary billions in funding for massive public investment to drive down the cost of clean energy technologies, a down-payment on a carbon-neutral, prosperous America. 1) We need to put a price on carbon emissions to harness the innovation and power of markets to find solutions to the climate crisis and ensure we reduce global warming pollution to a safe level. 2) The atmosphere is a common good, owned by all Americans, not just polluters. We should therefore force polluters to pay for the privilege to emit global warming pollution, raising billions of dollars in the process. a) we can pump much of that money into accelerating the transformation of our energy economy to a sustainable, low-carbon system. We can provide incentives to lower the costs of clean energy technologies, provide R&D and fund public-private partnerships to accelerate the deployment of the next generation of clean energy technologies and support the innovation fueled by the carbon regulation itself, all the while building a new energy economy and millions of "green collar" jobs. b) we can use some of the money to reform our tax structure so that it is more progressive and leaves more money in the pockets of average Americans. These reforms will more than offset the increases (if any) in your energy bill (remember that increased efficiency can offset the effects of increased energy prices too) so in the end, the average American will be better off under a cap-and-auction system than her or she was before. That's the recipe for a carbon-neutral, prosperous America in my mind, and it doesn't seem like I'd get much argument from environmentalists or from Nordhaus and Shellenberger on that point. This is the platform that we should all be rallying behind, rather than fighting over which is better, regulation or investment. The answer is that neither will solve the climate crisis without the other - and we all seem to be in agreement there too! So in closing, where's all the controversy, folks? Maybe it's time to call a cease-fire! Will you Step It Up! and invite your representatives to your local Step It Up 2 rally on November 3rd? "Backs against the wall" is not a scientific measurement, but it's right where we are on global warming. It's the vernacular translation for when the National Snow and Ice Data Center reports that this year the summer Arctic sea ice shrunk to the smallest area ever recorded, about 460,000 square miles less than the previous low point recorded in September 2005. It's what it means when the chair of the Intergovernmental Panel on Climate Change tells reporters, as he did last week, "Wheat production in India is already in decline, for no other reason than climate change. Everyone thought we didn't have to worry about Indian agriculture for several decades. Now we know it's being affected now." He added that a similar shift seems to be underway in China. And when your back is against the wall, that's when you've got to fight, and fight like you mean it. That's why we're launching Step It Up 2. On Nov. 3, people all across the country are holding rallies to demand action on global warming. Find out if there's one scheduled for your vicinity; if there isn't, then sign up to start one. We can help make it easy -- you're not organizing a March on Washington, just a gathering of your neighbors. Assuming there's an action somewhere in your neighborhood, you can use our nifty new invite tool to ask politicians to attend -- to ask them if they're ready to stop being politicians and start being leaders. Find your senators and representative on the list, and we give you all the info you need to call, email, or send a letter inviting them to an event near you. Even if they've already been invited, send them another invitation. And if they've already accepted, send them your thanks. While you're at it, you can ask the presidential candidates to come to your local rally too. The more invitations the merrier. Our goal is to have more politicians talking to more people about a single issue on a single day than ever before. And having those people talk back, having them demand not empty rhetoric but real progress. We've got a widget or internet tool that tracks how many politicians have been invited and how many have said yes -- watch it on this page, at right, or on the Step It Up 2 website, or add it to your own site. We don't have a $1,000 a plate to lure our politicians to come meet with us. All we have is the power to ask, and the power to see who responds. And by "we," I mean "you." A scholar-in-residence at Middlebury College, Bill McKibben is the author of The End of Nature, the first book for a general audience on climate change, and, most recently, Deep Economy: The Wealth of Communities and the Durable Future. He is also the Project Director of Step it UP!, a nationwide grassroots climate activism campaign calling for national solutions to the climate crisis. A Man of Action: Ted Glick Still Fasting for the Climate After 21 Days! On September 4th, I joined 1200 others in the Climate Emergency Fast to call attention to the human face of climate change. The fast was timed to put pressure on Congress to take action to solve the climate crisis as they returned from summer holidays. On that day, most of us voluntarily gave up food for one day to feel pangs of hunger and remember that as global warming intensifies, it will bring with it much more extensive hunger worldwide, especially in poorer countries, as drought, intense storms, glacial melting and sea level rise take their toll. Those crazy Californians are at it again: on Monday, the California Public Utility Commission suggested a "ambitious but attainable" goal that by 2020, all new housing in California be so energy efficient that every subdivision could easily produce all it's own energy with on-site solar panels, wind turbines or small generators. Commercial buildings would follow suit by 2030. With energy use in buildings responsible for almost half of all annual greenhouse gas emissions and two-thirds of all U.S. electricity generation going to homes and businesses, "Zero-net-energy" homes and businesses could be a potent tool in the fight against global warming. Trouble is, the CPUC doesn't regulate the housing market (just investor-owned California utilities). The California Energy Commission does set energy efficiency standards for new construction and the California Legislature could always pass aggressive new building codes. Still, the California Public Utility Commission's advocacy of super-efficient new construction could set a revolutionary process in motion: zero-net-energy building standards open the door for a revolutionary change in electricity production to a distributed web of customer-sited generation, forestalling the need for new central-station power plants and massive investments in long-distance transmissions infrastructure. SFGate (the San Fransisco Chronicle's online home) has the full story. LONDON, Sept 19: New York oil prices surged to a record high $82.51 per barrel on Wednesday following news that American crude reserves tumbled last week. New York’s main futures contract, light sweet crude for delivery in October, hit the historic peak after publication of the US Department of Energy (DoE) weekly report. In London, the price of Brent North Sea crude for November delivery jumped to $78.49 per barrel — which was not far off its all-time high of $78.64 that was struck in August 2006. The DoE said on Wednesday that US crude inventories plunged by 3.8 million barrels to 318.8 million barrels in the week ending September 14. That marked the tenth successive weekly drop and was almost double analysts’ consensus forecasts for a fall of about 2.0 million barrels. Prices were “led by the US crude inventories,” said AG Edwards analyst Eric Wittenauer. American gasoline or petrol stockpiles rose by 400,000 barrels last week, the DoE added, confounding market expectations for a drop of 1.0 million. Distillates, which include diesel and heating fuel, advanced by 1.5 million barrels, which tallied with forecasts for a 1.23-million-barrel gain. In later deals, New York crude pulled back to stand at $81.51, unchanged from the close on Tuesday. London Brent meanwhile stood 12 cents higher at $77.71 per barrel. In recent days, oil prices in New York have streaked to record highs on concerns about tight global supplies and rising demand. Traders are fearful of a supply crunch in the fourth quarter of 2007 as heating fuel demand hits a peak during the cold northern hemisphere winter months. New York crude had surged past $82 per barrel on Tuesday after the US Federal Reserve slashed interest rates to boost the flagging United States economy — which is the biggest global market for crude oil. For some time, oil market traders have been concerned that an economic slowdown in the US would dampen crude demand and lead to lower prices. “Crude oil prices... rose in the wake of the Fed’s decision to cut rates by 50 basis points,” Australia’s Commonwealth Bank said in a market commentary. Analysts at US investment bank Goldman Sachs have said oil could soar as high as $90 a barrel between now and the end of the year and could reach $95 by the end of 2008. Industry analysts argue that a recent Opec decision to boost output by 500,000 barrels a day was insufficient and came too late to meet rising winter-related demand. Hill Heat's the Cunctator takes a look at which 'congress critters' have been writing global warming legislation, and it's probably not who you'd want! When it comes to perhaps the most important legislation of the century - legislation to solve the climate crisis - who's holding the pen? You would hope it would be people like Senate Environment and Public Works Committee Chair, Senator Barbara Boxer, or House climate change champion Henry Waxman. Well, while the two have sponsored the best climate change proposals currently floating around Congress, it's unfortunately not the likes of Boxer and Waxman who are drafting the default global warming legislation that will likely be taken up by both the House and Senate this fall/winter. In the House, jurisdiction over cap-and-trade legislation is under Energy and Commerce chairman John Dingell and Energy and Air Quality Subcommittee chair Rick Boucher. In the Senate, Harry Reid and EPW chair Barbara Boxer are letting Joe Lieberman and John Warner write the default global warming bill. Dingell literally represents Detroit. His wife works for General Motors. Boucher is a coal-district representative who supports coal-to-liquids and tried to make California's greenhouse gas emissions law illegal. Lieberman used to be a Democrat. Warner has a 14% lifetime score from the League of Conservation Voters. Unless they're stopped, these people will write polluter-protection legislation. Carbon cap-and-trade legislation cannot be progressive if the greenhouse gas emissions credits (the pollution credits) are given to polluters. That protects polluting industries with a subsidizing give-away of a common resource, the atmosphere's capacity for GHG pollution. If the credits are auctioned, however, polluters have to pay. Furthermore, this means that the taxpayers of the United States receive the fair market value of privatizing this resource (as long as the government properly allocates the auction revenues). The "bipartisan" Lieberman-Warner climate change proposal currently plans to give away 76% of the emissions allowances under the cap for free. The proposal would amount to a giant wind-fall for polluters, violating the "polluter-pays" principle that's key to effective environmental legislation and essentially giving away a public good - the atmosphere - for free. Additionally, the emissions reduction targets in the Lieberman-Warner proposal are mediocre and are a slow start to cleaning up our act. Unlike Boxer and Waxman's proposals, the Lieberman-Warner proposal doesn't put us on a track to a carbon neutral and prosperous America, which should be our ultimate target. Lieberman recently indicated he's thinking about reducing the amount of allowances given away for free (and auctioning more of them), but at this point he's just thinking about it. And so far, the mediocre emissions reduction targets haven't budged. As Adam Siegel writes, with the likes of Dingell, Boucher, Lieberman and Warner in the drivers seat, "we -- that means you -- should be contacting your representatives to influence the process." Start with, if you wish, Congress.ORG, write your representative, send in a letter to the editor [and I would add, send a letter to Lieberman too]. 1. Support Citizen, not special interest, Ownership of Pollution Credits -- it is our air that we are seeing polluting, make them pay us for dirtying our air. NO GIVEAWAYS OF POLLUTION CREDITS in Climate Change legislation. 2. The 2050 target: a Climate Friendly Prosperous Society that will enhance human security for millenia to come. 70% by 2050 is, simply, slowing the onset of catastrophic climate change. 80% is an absolute minimum, 90% becomes reasonable, and Carbon Neutrality (actually carbon negative) should be our target. Let us reach high, for the sky, and protect ourselves and future generations. Suppose you're a business major attending a great business school. Your chances of being wealthy are pretty high. Ten years later, you decide to live near a poor neighborhood, but your standard of living is high (i.e. you have more than what you need and you produce lots of wastes). There are no services to pick up waste, so you decide to dump it in the area where the poor people live. They, on the other hand, don't produce as much waste, and probably can't do more than complain because you've got the big bucks and you can get them into trouble if you wanted to. You try to calm them by explaining that there's no harm and that they should go on their daily lives as usual. But eventually, some scientists get together and show this waste is killing these people, and morally it is clear to the judge that you've gotta clean up your act. Not only do you have to take out their stuff, but you gotta figure out where your waste is going (or you gotta stop producing it) and you gotta compensate them for their loss. Or did you think you were playing some game on X-Box where you do whatever the hell you wanted at no cost? Today, a report was released concluding that world agriculture will drop by 16% by the year 2080. By then, our population will probably have grown by 30-50%. Most of the drop will be in developing nations, many of which will be developed by then, unless global warming says otherwise. This will mean absolute chaos. Another report mentioned that dirty energy was affecting the health of 2 billion people worldwide. This doesn't include those people whose health is being affected by simply thinking about the fact that we're still heavily based on fossil fuels! And just today, the price of oil hit $80/barrel. Italy also came out with a report saying that they were warming faster than anywhere else, and that climate change would take off 30-50 of their GDP with business-as-usual. Then came a security report saying that global warming will be equivalent to a global nuclear war! So, on one hand we've got rich nations that have dumped 75% of all greenhouse gases into the atmosphere, on another we've got billions of people being victims of waste the developed nations dumped on them, and on some other magical hand we have tons of evidence saying we're guaranteed a flight to hell if we don't do something serious. 1) Binding commitment to a climate neutral world within 20 years, with no make-it-easy-for-the-rich junk like CDM, JI, or cap-and-trade on certain industries. The commitment needs a complete transformation of the electrical grid, the transportation system, etc. 2) The pumping of at least 3/4 of all the money developing nations will need to shut down their power plants, pay those plant owners and transform their transport system equitably, and get fully powered by renewables. 3) Pay for developing nations at least 75% of the expenses that will go into adapting to the crazy climate they'll continue to have. If the language isn't the same everywhere, if the urgency about how serious this stuff is getting isn't there, if people aren't thinking beyond "leadership" and understanding equity, and if a movement isn't calling for a climate neutral world, then we can say that the only tipping point we'll see will be the one that will plunge us into climate hell. If you still think this is radical, not feasible, not strategic, a different issue, situation, scale, or whatever else, put yourself in the position of the poor people who could do nothing or knew nothing about the waste the rich guy was dumping on them. If you're a human, what you want is a complete elimination of what's happening and compensation for what you lost, not just removal of a bit of trash. Reality is not what the politicians or the business people are telling us they can do; reality is what needs to happen if the world where the poor people and the rich guy live is truly just. If it isn't, then recognize that the Earth will roast us like chicken within our lifetime. If it isn't, then why do we allow it? If it isn't, then why don't we make it? The only tipping point that will save us is a global commitment to climate neutrality and climate equality! The path: frame the message! Please support the Youth Delegation of Conscience to Bali. This fall promises a groundswell of activism that will break through the barriers of what is commonly believed to be politically possible. The combined impacts of Power Shift 2007, Step It Up 2, the National Climate Fast, International Day of Climate Action, No War - No Warming, and the launch of the second year of the Campus Climate Challenge is going to stun political insiders who assume they have mapped the landscape. However, as young activists we are expected to perform grassroots activism. What they will not expect will be us crashing the gates of international climate negotiations. But we have done it before. In Montreal, we changed the world. It's Getting Hot in Here told the story of how a ragtag group of youth climate activists shook apart the conventional wisdom of international climate negotiations. Our best and brightest took to the streets to show the world that there was the passion for change in the United States and that we would force change at home and they could move forward in the face of President Bush's resistance to any solution to global warming. In Bali, this December, the world's leaders and diplomats will meet once more...this time to determine the mandate for what will be the next and most dangerous step in furthering international climate action. Bush and his Big Oil soaked negotiators want to replace binding international targets with airy promises and voluntary, aspirational goals. It would be folly to let him do it when he has so little time in office. We have one response. We are sending a Youth Delegation of Conscience to the Bali negotiations. We will call upon the leaders of the world to remember their own children, whose future they hold in their hands. We will call for intergenerational and international climate justice. Our delegation will bring messages of hope, stories of pain, and focus the will of the climate activists here upon these distant meetings. But we need your help. Our 22 person Youth Delegation of Conscience is entirely organized by volunteers and together we are putting in thousands of volunteer hours to make this happen. We have received our accreditation for the conference and are putting together communications teams, policy statements, and building bridges with international youth groups and dozens of organizations. You can meet the delegation, here. But we need your support to get us to Bali. SixDegrees.org is a website that directs people towards contributing online to charities. They are currently offering a matching grant to the six organizations with the most contributors between now and September 16th. The important thing is the number of contributions, not the amount. The minimum contribution is only $10. If we can get 300 of us to contribute at least $10, all of the money contributed up to $10,000 will be matched. To invest in our future, use the link below. 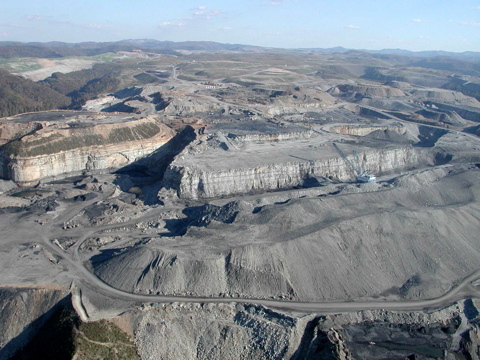 As if it isn’t clear that global warming is being fueled by our use of fossil fuels, the Bush administration is coming up with new rules that will allow coal companies to expand their mountaintop removal activities. Despite major support for a clean energy economy from the public and many in the private sector, the Bush administration has decided to once again ignore the massive public outcry in the hopes of making a few wealthier. Coal is the main source of global warming pollution by far. The cheapest way of extracting coal, called strip mining or mountaintop removal, has already flattened more than 400 mountains, destroyed dozens of communities, filled up thousands of miles of rivers and streams with toxic waste and eliminated vast areas of forests in the U.S. In today's The Oregonian, an article painted what we have been hearing as a very dire future for Greenland and West Antarctica. Now, new data has shocked scientists because Greenland, like the Arctic sea ice, is melting much faster than the most optimistic projections of the IPCC, as expected. You see, the IPCC has people who really know their thing, and people who kind of know and so want to fight about what is said. From now on, we should base what we know about climate on current observations, not a document that will be unchanged for at least 5 years. At the UK Climate Camps, organized by climate activists who see the growth in aviation a huge barrier to eliminating global warming pollution, George Monbiot said his recent book, Heat, is now outdated because of the recently recorded effects of global warming, which point to the fact that the industrialized world must be climate neutral within 2 decades to perhaps have a chance of preventing the ice sheets from fighting back. Perhaps scarier than that was the idea that as these massive ice sheets melt, the land beneath it springs back. What if the land beneath these ice sheets can influence land elsewhere? Another scary observation is the fact that the Arctic tundra, as opposed the the Alaskan tundra, has been found to contain massive amounts of carbon as well that could spontaneously be released with moderate warming. All this points to a clear picture. We need a climate neutral world as soon as possible. How can this happen? Well, carbon capture and sequestration won't be commercial until at least 2020, and even if it did China will not pay more for something it's sure it hasn't largely caused (though recently it has announced it will spend over $250 billion in renewables, more than the U.S. has committed to; plus, they have an RPS, and we don't). A new international treaty must be about greenhouse gas elimination and equity. The world must become climate neutral, but nations should pay their fair amount. The developed world, having put up there some 70% of all emissions, must pay 70% of what it will cost to make the world climate neutral (and this means shutting down every single coal-burning power plant and being fully powered by renewables). After all, if it can waste money in useless wars, unnecessary congestion and consumption, and huge armies, it can pay for the most threatening problem ever to face humanity. The good news is that it may well turn out to be a money-maker in the long-term, though at an initial cost. The Ice Sheets are speaking. Their message is clear: either we do or we die. Like his earlier work, The Skeptical Environmentalist, which prominent Harvard biologist E.O. Wilson called a "sordid mess" and was found to have cherry-picked the facts, Bjorn Lomborg's latest effort, Cool It: The Skeptical Environmentalist's Guide to Global Warming is just more hot air. Lomborg's basic thesis, that "scare-monger" environmentalists have over-hyped the threat of climate change and that we shouldn't take any serious action to tackle the climate crisis because doing so would harm economic growth that poor people need requires a particularly slanted view of the world and rests on 'facts' selectively picked to support his arguments as he ignores a vast body of science. "In "Cool It," Lomborg has three messages. First, the planet will warm up no more than 4.7 degrees Fahrenheit this century, and on balance, this will be bad, but not too bad. Second, all benefit-cost models show that serious limits on global warming emissions are too costly, and therefore we should pollute with virtual impunity. And -- surprisingly -- we should invest a decent amount ($25 billion per year) in clean energy technologies now so that, starting in a few decades, we will have tools to slow down global warming just a little bit through 2100." While I can't agree more with the third point, his first two messages are quite frankly bull sh!t. Lomborg's first argument assumes that global warming will be held to "only" 4.7 degrees F. First off, that's a swing of temperatures halfway to ice age proportions (the last ice age was only 9 degrees F colder than today). Not a big deal, eh? Lomborg argues that as the temperatures heat up, deaths from heat waves will be offset by less deaths from cold exposure. This contradicts the United Nation's Intergovernmental Panel on Climate Change's authoritative Fourth Assessment Report, released earlier this year. The report does agree that cold deaths will decrease with warming, but says that while "climate change is projected to bring some benefits, such as fewer deaths from cold exposure ... overall it is expected that these benefits will be outweighed by the negative health benefits of rising temperatures, especially worldwide" (see pdf). So sure, Mr. Lomborg, less people will die of cold exposure in rich countries in Northern climes. But at the same time, the IPCC report warns that literally billions of people will be affected by water and food shortages, droughts, floods, storms, etc. People in poorer developing countries, the people Lomborg supposedly cares so much about, will be most severely affected. For more on the human face of climate change that Lomborg's cold calculus brushes aside, see this post. These aren't the made-up scenarios of "fear-mongering environmentalists." They're the warnings of an international body of the world's top climate scientists, literally hundreds of them, and the report they produced is truly a consensus document; every word in the "summary for policymakers" report I referenced above (pdf) has to be approved by representatives of 130+ countries (including representatives of the Bush Administration)! In fact, throughout his book, Lomborg cites the IPCC report like gospel, all the while selectively ignoring much that doesn't serve his arguments. For example, in assuming that temperatures will not warm by more than 4.7 degrees, despite the inaction that he advocates, he ignores the fact that the IPCC includes a range of temperature estimates going all the way up to 10.5 degrees. "The global warming "alarmism" that Lomborg finds so distasteful is motivated by a serious, science-driven concern that hidden within our global climate system are powerful positive feedback loops. So that as we inch up from 3 to 4 and then 4 to 5 degrees of warming, we may very well cross some temperature threshold that would trigger a couple of degrees of further warming, causing a catastrophic upward spiral in global temperatures. For example, if the Amazon heats up and dries out too much, much of it could burn down, flipping to savannah, and releasing tens of billions of tons of CO2 into the atmosphere. Similarly, as the permafrost in the Arctic melts, a huge pulse of methane may be released. The science is clear that, interacting, these and other biophysical and socioeconomic factors could drive planetary temperatures far beyond the range that Lomborg addresses. By ignoring the vast uncertainty underlying these forecasts, and every alternative outcome except his preferred "moderate" warming scenario, "Cool It" reduces to an uninteresting discussion of why folks alive today should choose 4.7 degrees of warming rather than 4.4 as the optimal outcome for our grandkids." But there is no sound scientific reason to assume that as we sit inactively, following Lomborg's advice, that temperatures will stop rising at 4.7 degrees. In fact, there is every reason to worry that if we don't begin a proactive, concerted effort to halt warming temperatures within the next few years, we will lock ourselves in to a degree of warming that will push us past what America's top climate scientist, Dr. James Hansen, calls 'the Tipping Point' where temperatures and greenhouse gas levels will have increased enough to set off a chain reaction of these feedback loops that will push global warming beyond our control. Once we pass the Tipping Point, warming will simply spin out of control and no matter what we do, we won't be able to halt or reverse the changing climate. We could stop using all fossil fuels entirely, but if we did it one day after crossing the Tipping Point - think of it as the Point of No Return - it wouldn't do a damn bit of good. "In my opinion," he testified in 2006, "there is no significant doubt (probability > 99%)" that projections for warming in a business-as-usual future (one that Lomborg advocates) "would push the Earth beyond the tipping point and cause dramatic climate impacts including eventual sea level rise of at least several meters, extermination of a substantial fraction of the animal and plant species on the planet, and major regional climate disruptions." Translation: unless we act soon to change course and avoid this business as usual future, we will almost certainly pass the Point of No Return. By ignoring this fundamental and critical characteristic of climate systems, Lomborg's thesis that waiting to tackle climate change until technology develops is fundamentally flawed. In a supposed 'rational discussion' of risks, trade-offs and benefits of climate change, Lomborg ignores the biggest risk of all: that in sitting idle, we will cross the Tipping Point. As a result, Lomborg advocates for delayed action against climate change, essentially arguing that we play Russian roulette with our lives and the fate of all future inhabitants of the planet. There are other flaws with Lomborg's book, and I'd encourage you to read Goodstein's review for more, but I'll leave it at that for now. Don't pick up Lomborg's book unless you're looking for more misleading, heel-dragging hot air. 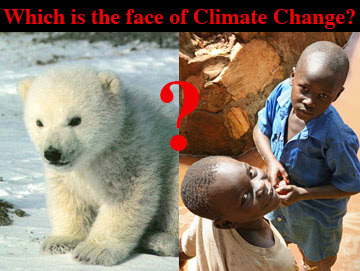 When you think about the climate crisis, which of these two images stands out as the face of climate change? Chances are, the polar bear cub is more closely associated with global warming in your mind than the two Sudanese children on the right. Global warming may threaten one quarter to one half of all species on the planet with extinction if left unchecked, and the unprecedented human-caused loss of so many of our cousins on this small blue globe certainly conjures up images of one of the most charismatic species threatened by our warming planet: the polar bear. But what about the human face of climate change? Global warming certainly poses an unprecedented environmental and ecological catastrophe and preserving the habitats and species threatened by the climate crisis may be motivation enough to tackle the challenge. But the climate crisis doesn't just threaten cute and cuddly animals and their less charismatic cousins. I would argue that the real face of climate change is, or should be, a human face. The second of the Intergovernmental Panel on Climate Change's reports released this year detailed the human impacts and vulnerabilities of climate change and it painted a bleak picture of starvation, thirst and extreme weather impacts (see pdf). Today, I join over eleven hundred others in the Climate Emergency Fast to raise awareness of these human impacts of climate change. Today, as Congress returns from recess and Americans return to work after a long Labor Day weekend, hundreds of us will make a small sacrifice to send a message: It’s time for our leaders, at all levels of government, to take action to solve the climate crisis! Today, we will feel hunger and remember that as global warming intensifies, it will bring with it much more extensive hunger worldwide, especially in poorer countries, as drought, intense storms, glacial melting and sea level rise take their toll. Many are begin fasts today that will last much longer than one day. Join me today in taking a closer look at the human face of climate change. "As the world gets hotter by degrees, millions of poor people will suffer from hunger, thirst, floods and disease unless drastic action is taken." That was the Associated Press's summary of the Intergovernmental Panel on Climate Change's (IPCC) second working group report, entitled Impacts, Adaptation and Vulnerability (pdf). The report, released in April by the IPCC, a UN network of thousands of climate scientists, details the impacts of climate change, particularly those affecting human populations. The report is a true consensus document assembled by literally thousands of scientists and unanimously approved by the 120-plus governments that participate, including representatives of the Bush Administration. Despite the high level of consensus required of the document, and a deadline-busting contentious final editing session described by the AP article, the IPCC report was nonetheless the strongest authoritative warning that all the world's nations must take concrete actions to address the climate crisis or hundreds of millions of human lives will be impacted, impoverished or lost. The picture the report paints is bleak, yet preventable, and we should use it to help keep in mind the human face of climate change. Water shortages: water is the stuff of life, yet climate change will mean water shortages and reduced water supplies for literally billions of people. The IPCC reports that while total annual water availability may increase in higher latitudes and in some wet tropical areas, water supplies will likely decrease in already dryer and water-stressed regions. Drought-stricken areas will increase and droughts are projected to become more severe. Additionally, warming temperatures will mean less precipitation falls as snow, being captured in snowpack and glaciers. This will make river flows more seasonal and make summer months - when snow and glacier melt traditionally keeps rivers flowing - more prone to drought while increasing the incidence of winter and spring flooding. According to the IPCC, water supplies stored in glaciers and snow cover will decline, reducing water availability in regions supplied by meltwater from major mountain ranges including the Himalayas in Asia, the Andes in South America and the Cascades/Sierras and Rockies in North America. This could affect areas home to one-sixth of the total world population! The IPCC projects that between 75 and 250 million Africans will face increased water shortages due to climate change and more than a billion people in Central, South, East and Southeast Asia will be adversely affected by reduced freshwater availability. Water security problems in Australia, already a consistent problem, are projected to intensify by 2030 and areas in the United States' Dessert Southwest will face more frequent and severe drought. When coupled with growing populations and increasing standards of living, demand for clean, fresh water will clearly increase, putting further stress on water supplies reduced by climate change. Food and Famine: Reduced water supplies not only threaten drinking water availability, but also present a clear problem for agriculture. The IPCC projects that while on average, worldwide crop productivity may increase slightly with the first couple degrees of warming, further warming will mean crop yields will likely plummet and regional yields, especially in seasonally dry equatorial areas, are projected to decrease even with small temperature increases. As would be expected, more frequent and severe droughts and floods (see above) are projected to ravage local agricultural activities. Agricultural production in many African countries is projected to be "severely compromised by climate variability and change," the IPCC reports, which would "further adversely affect food security and exacerbate malnutrition on the continent." 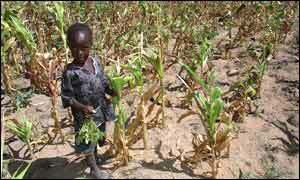 In some countries, agricultural yields may be cut in half, the IPCC reports. Crop yields may increase by up to 20% in East and Southeast Asia while falling up to 30% in Central and South Asia by mid-century, the IPCC reports. "Taken together," the report says, "and considering the influence of rapid population growth and urbanization, the risk of hunger is projected to remain very high in several developing countries" in Asia. Productivity from agriculture is projected to decline over much of Australia's southern and eastern regions, home to the large bulk of the country's population and it's major breadbasket. This summer, Australians got a sneak preview of what's to come, as their Prime Minister told them to pray for rain as prolonged drought forced Australians to consider cutting off water for irrigation in order to supply drinking water for urban areas. This year, just enough rain fell in June and July to forestall this dire outcome, but will Australian's be so lucky in years to come? Rising seas: The IPCC report predicts that coastal areas will be exposed to increased coastal erosion due to climate change and the resulting sea-level rise and the effect will be exacerbated by increased population pressures along coastal areas. Coastal wetlands, important flood and storm protection barriers, will be lost to rising seas at the same time they are being lost to human development activities, making coastal populations more vulnerable to hurricanes, tsunamis and monsoons. "Many millions more" people are expected to be flooded every year due to sea level rise, the report projects. Densely-populated low-lying areas like the 'mega-delta' areas of Asia and African including broad areas of Bangladesh, India and China will b particularly vulnerable, as will small, low-lying islands. Whole island nations may be lost and their populations relocated. As usual, adaptation in poorer, developing countries will be more difficult, placing these populations at higher risk. -several infectious diseases, including malaria, will be wider spread due to increased habitable areas of important vectors like mosquitoes. The report does note that climate change will likely bring fewer deaths from cold exposure, but these benefits will be "outweighed by the negative health effects of rising temperatures worldwide, especially in developing countries." Flood, fire, heatwaves and storms: Extreme weather events including floods, forest fires, heatwaves and hurricanes are all expected to become either more frequent or more intense as the planet warms. So we've got thirst, famine, disease, floods, droughts, and storms - all some pretty Biblical stuff with millions of human lives caught in the cross hairs. I don't write all of this to depress us - the good news is that much of this is still avoidable, including the worst affects of climate change, if we act now. I write this to remind us that the face of climate change is a very human face indeed. Literally billions of humans will be negatively affected by the climate crisis, with those in poorer, developing countries feeling the brunt of the warming world's effects. So next time you think about climate change, don't just think about the loss of countless species, some even as cute and cuddly as penguins and polar bears. Their loss is a tragedy, one that climate change activist and economist Eban Goodstein eloquently argues will impoverish our economy, our lives and our very spirit. Massive species extinction presents a clear moral imperative and a primary motivation for tackling the climate change. But remember that their is also another, very human face to the climate crisis. If left unchecked, climate change will takes its toll on billions of our fellow humans, devastating the lives of many millions. I fast today to remember this human face of the climate crisis and to urge our leaders to take this crisis as seriously as I do, to take action now, and to rise to the challenge and seize the tremendous opportunity the climate crisis presents. The dark future described in the IPCC report hangs over us, but another future is possible, a brighter future where the climate crisis is the catalyst for a sustainable, just energy future. It is up to each one of us to decide which future we want to live in, and make that future a reality. Making landfall today as a devastating Category 5 storm, Hurricane Felix is the second Cat 5 Atlantic hurricane to make landfall in as many weeks, carving a path of destruction across Central America. As Chris Mooney points out at the Daily Green, "Nature isn't messing around this year in the Atlantic hurricane basin." So far, we've already seen six named storms and two hurricanes, both making landfall as devastating Category 5 storms, shattering records and making landfall within two weeks of each other. And there's still a long way to go until the 2007 hurricane season has subsided. Like Hurricane Dean, which ripped across Mexico's Yucatan Penninsula on August 21st (see previous post), Hurricane Felix hit the coast of Nicaragua with Category 5 strength (Hurricane Katrina was made landfall near New Orleans as a Category 4 storm, for comparison), shattering several records. Also like Hurricane Dean, the appearance of a second, record-breaking storm in as many weeks must give us pause to not only acknowledge the destruction it has wrought as it cuts a swathe across Nicaragua, Honduras, El Salvador and Guatemala, but also to worry about what else this year's hurricane season might have in store as we ponder the connection between global warming and a disturbing trend of intensifying hurricanes. Offical estimates call for an "above-normal" Atlantic hurricane season and predict 13-16 named storms (Felix is just the sixth so far this season). The peak months of the Atlantic hurricane season are August through October, so the season has just begun in earnest. Chris Mooney worries that "we might be seeing intense hurricane clustering in the Carribean. Sometimes the winds and water just set up in such a way that a particular stretch of ocean gest repeated Category 4 and 5 storms," Mooney explains. "The phenomenon occurence in the Cook Islands in 2005, with four intense hurricanes in just over a month, and similarly off the coast of the Phillipeans in 2006." Could a similar phenomenon be occurring in the Caribbean this year? Only time will tell. Additionally, if a storm enters the Gulf of Mexico this year, there is a disturbing arrow of hot sea surface temperatures currently pointing directly at Louisiana. Hurricane intensity is fueled by warm water temps and the current map of sea surface temps means that if winds and other conditions line up, sea temps could fuel another intense storm making landfall on the Gulf Coast. 2. Second-fastest pressure fall in 12 hours (50 millibars), third-fastest in 24 hours (63 millibars). Again, apparently this is an Atlantic-only record. 3. 13th full Category 5 hurricane landfall in the Atlantic region. Others include 1935’s “Labor Day” storm, 1969’s Camille, 1992’s Andrew, and 2007’s Dean. 4. Felix makes 2007 only the fourth known Atlantic hurricane season to have more than one Category 5 hurricane. The others are 1960, 1961, and 2005. 5. Felix makes 2007 the only known Atlantic hurricane season to have two full Category 5 landfalls. 6. Felix makes 2007 the only known Atlantic hurricane season in which the first two storms to reach hurricane status (Dean, Felix) have also reached Category 5 status and gone on to Category 5 landfalls. As with Hurricane Dean, we cannot blame global warming for Hurricane Felix, nor for any single extreme weather event. However, hurricane intensity is fueled by warm ocean temperatures, and the recent up-tick in intense Category 4 and 5 storms is consistent with scientific predictions based on basic thermodynamics and higher ocean temperatures due to global warming. After not having one since Andrew in 1992, we are now expected to see two Category 5 Atlantic basin hurricane landfalls in the space of 2 weeks. There have been eight Category 5 Atlantic hurricanes so far in the 2000s; no other decade has had so many. The closest runner up is the 1960s with six (Donna, Ethel, Carla, Hattie, Beulah, Camille). Mooney goes on to caution that it is likely that we failed to record at least a few Category 5 storms in earlier decades due to poorer instrumentation and observation systems. However, even with that caveat, we've got to recognize that this decade has been clearly anomalous when compared to previous decades (and it's far from over yet). Is it fair for us to point the finger at global warming for this disturbing trend? Well, it will take more time to demonstrate that this trend of intensifying storms holds true, and a lot more work to show conclusively that this trend is due to global warming. However, climate scientists clearly predict global warming will bring higher sea surface temperatures and the resulting intensification of hurricanes and tropical storms, and the recent monster storms we've seen in the Atlantic and around the world have fit predictions to a T.
As Chris Mooney writes, "at some point, it seems to me that people will simply have to throw up their hands and say: We are in a new place now." Interested in learning more about what we can and can't say about extreme weather events and global warming? Pick up Chris Mooney's new book, Storm World: Hurricanes, Politics, and the Battle Over Global Warming.